Summary: After a two week hiatus because the Sun was between the Earth and Mars and blocking communications, both rovers are once again on the move. Since my last update on July 12,, Curiosity spent most of the month waiting out the solar conjunction that placed the Sun between the Earth and Mars and blocked communications. In the past few days, however, the rover has begun to send down images again while resuming its journey up Mt. Sharp. The panorama above, reduced to show here, was taken by the rover’s left navigation camera, and shows the mountain, the ridge, and the route the rover will take to circle around the steepest sections to get up onto the ridge. To see the full resolution panorama click on the picture. 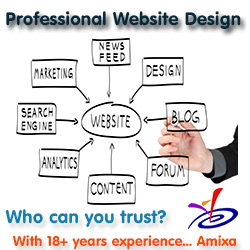 To the right is a full resolution section of the area in the white box. As you can see, the geology of the ridge is many-layered, with numerous vertical seams or cracks. In order to track the geological changes across these layers as the rover climbs, the science team is as expected taking a systematic approach. Lately, one of our biggest science objectives is to conduct bedrock APXS measurements with every 5-meter climb in elevation. This allows us to systematically analyze geochemical changes in the Murray formation as we continue to climb Mount Sharp. Yesterday’s drive brought us 6 meters higher in elevation, so another touch and go for today it is! Below is a cropped and reduced resolution image of the most recent orbital traverse image, dated sol 1754. 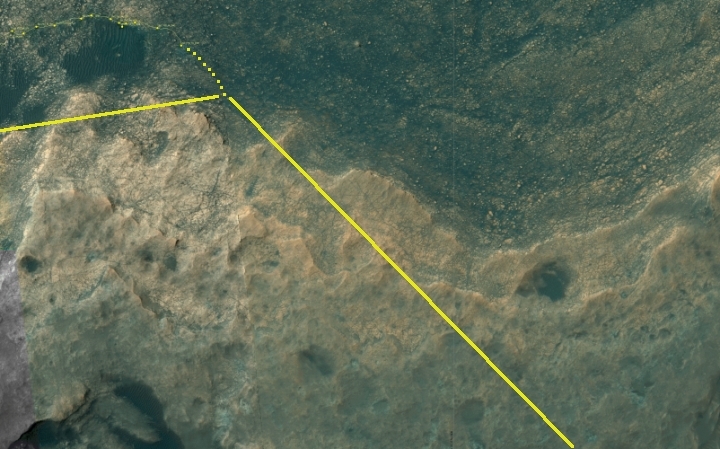 The dotted line shows where I think the rover’s has traveled in the last 28 sols. I have also annotated what I think is the point of view of the panorama above. 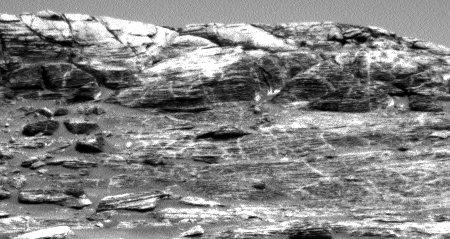 The image clearly shows the erosion process that has eaten away at the light-brown layers of the Hematite Unit that forms Vera Rubin Ridge. As you climb upward to the south, you can see the layers that curve around concentrically and parallel to the beginning of the ridgeline. Curiosity is moving across those layers now. In a very short time it will finally leave the Murray Formation, the geological layer it has been traversing since March 2016, and move up onto the Hematite Unit. Since my July 12 update,, not much with Opportunity has happened. Once they regained communications, they spent the first few days taking images. Then they had the rover resume travel, working down Perseverance Valley. 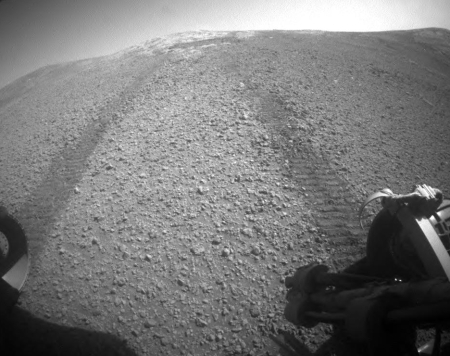 On Sol 4813 (August 7, 2017), Opportunity drove for the first time since conjunction, however the drive stopped short after 11 feet (3.5 meters) when the rover encountered some difficult terrain while turning. The next sol was used to bump the rover about 4 feet (1.2 meters) to get it away from the challenging rocky outcrop. The image on the right, taken by the rover’s rear hazard camera on Sol 4816 and reduced and cropped to show here, looks behind the rover and uphill. You can see the difference between the most recent fresh tracks and the earlier tracks, made almost a month ago. Because winter is coming, Opportunity will be doing less in the next few months, as it needs more time to recharge its batteries. It does appear however that the science team will continue to move slowly downhill into the valley, studying it to figure out if it was formed by water, water ice, or wind. It’s hard for me to get any sense of scale in the pictures from the Mars rovers. The scenery has elements that are familiar in some ways but completely foreign in others. Lately, I’ve been curious about how the light levels on Mars would appear to someone standing on the surface compared to the light levels as seen on Earth. Obviously the sunlight is dimmer on Mars, but by how much? I’ve seen percentages relative to Earth, but I would like to see it for myself. I think the lower light levels could have significant psychological effects to colonists. Living underground is bad enough, but getting short reprieves from the bunker only to see a dim Sun is too much for me. Whoever goes has my utmost respect. It’s easy to take all these pictures for granted until one really stops and thinks, these are from another world… extraordinary. Anthony Domanico: You might want to click through all of my rover updates to gain a sense of scale. I think I provided scale, but viewing quickly the overall travels and images over time I think will help you get scale. yeah, if you dig a little bit, Mr. Z. has created numerous helpful pics, and they really do give you a sense of scale. For Curiosity, a map with scale, that helped me.